The Galapagos are definitely a must-see spot IN THE WORLD, not only in Ecuador. Here are 10 facts you need to know about the island before your visit. No really, remember you will be on the line of the equator. No matter what time of year, the sun can come out and blitz you to pieces whenever it wants, so bring sunscreen, hats, and our favourite; a breazy long-sleeved shirt. The Galapagos are all about snorkeling and underwater life. Places will charge you for snorkel equipment and fins for the most part, so if you have them, bring them along! The water is FREEZING. This is not the Caribbean, or even the Ecuadorian mainland coast (yes the water is hot there). The thing is, who wouldn’t want to see manta rays, turtles, hammerhead sharks, and sea lions? You’d be crazy not to get in the water! You’ll be much more comfortable if you’re cruisin’ the waters with some layers on, so a wetsuit is ideal. If you don’t have a wetsuit, bring a surf top or shorts in wetsuit material, these will definitely help you to snorkel in relative comfort for longer. Bring comfortable shoes for walking on volcanic rock. Literally every hike or walk you go on, there will be uneven ground and pointy rocks out to get you. Your sandals might not be the most comfortable thing to wear, so make sure you bring some sneakers or light walking boots. We found our converse were a good light pair of shoes to pack. You will want to take photos underwater. Even if you say you don’t need to, the temptation once you are face to face with a sea lion doing flips to impress you will be overwhelming. We got a go-pro knock-off on Amazon that worked like charm, and the underwater videos were hilarious. Island hopping and winging it works! Although this may be a bit nerve-wracking, you don’t need to book tours in advance, and in fact they are cheaper once you are there. Last minute deals pop up all the time, and sometimes you can even hop on a cruise for waaay less than the prices you find online. Each island has a million tourist offices where you can book activities, so just make sure you ask around at a few and see what they all have on offer. If you do have some extra cash (we know this is not really a thing) boat tours or cruises are really worth the money. Instead of traveling to each location and back every day, a cruise allows you to go straight from one to the next. Sometimes you can visit up to 3 different locations in a single day, and they include food and all the extras so you won’t be spending money on top of the cost. Expect everything to be a bit more expensive, the Galapagos Islands are remote and everything is imported. Keep your wits about you, but just know you’re not necessarily being ripped off. Beers can easily cost $4, and a main can cost $10. Every single island is totally different. If there are certain species or landscapes you want to see, make sure you look up which island they are found on, as a lot of animals are only found in one area and sometimes only one island! The Galapagos Islands are the result of underwater volcanic activity and so all species of animals and plants present must have travelled at least 1000 miles to arrive here. Some were brought more recently by humans, but just imagine that iguana swimming 1000km to get here! You already made it here, so why stop there? 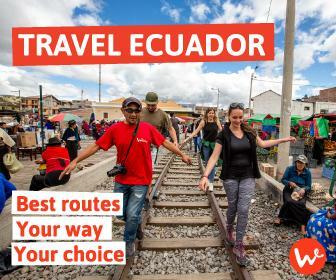 Check out everything Ecuador has to offer beyond Galapagos, including amazing beaches, a beautiful town in the heart of the Andes, a magnificent volcano, and one of the hottest beach towns in the Pacific Ocean. 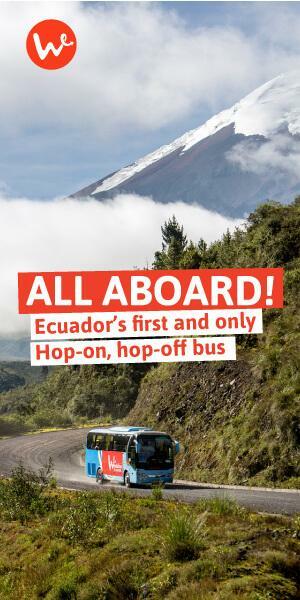 Wanderbus makes it so easy!